Disgraced Democrats know that there is life after rehab. It doesn’t matter whether you are an alcoholic, drug-addicted crackhead like Marion Barry, or a womanizing fraud like Bill Clinton; you have a place in the Democrat Party.Democrats love scoundrels. This is because it makes them feel good about all the bad things they are doing. 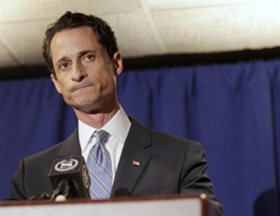 Anthony Weiner is no exception. So what he text-ed lewd pictures to women, embarrassing his PREGNANT wife. At least he didn’t father a child with his mistress, deny it, and sign up to be a running mate and potential Vice President! Weiner also has that cultural thing working for him.His wife is a Muslim and knows her place! Not to mention, Weiner has paid his dues by sitting out of politics for a minute. For Democrats he is eminently qualified to be mayor of NYC. At least New Yorkers know exactly what they will be getting, right! To read more by Kevin Jackson, visit TheBlackShere.net.